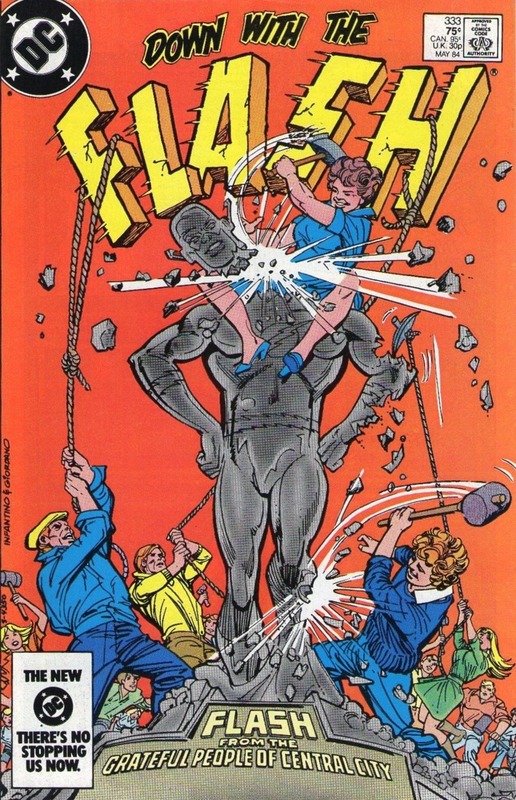 A few months back I reviewed the first part of the Trial of the Flash... it's funny, I always considered that story to be one that was universally reviled. Perhaps that's a bit naive, as it seems that every story has its fans, regardless of what the "popular" or "loudest" opinion may be. I have taken to reflipping through the SHOWCASE Presents volume devoted to it, though I'll concede I haven't revisited it in depth. Learning that this issue is somewhat divisive... I went ahead and suggested this storyline to the Divisive Issues podcast to cover. It's a fun show that covers some of the more controversial comic book stories of our time, and is definitely worth checking out if you have a free moment. Don't know that they'll find time to cover the behemoth that is the Trial of the Flash... I mean, you can choke a whale with the collected edition! Figure it's as good a time as any to pop back in on our scarlet speedster as he prepares to take the stand... in about a year. Okay, that was pithy, I apologize. We open with three shadowy masked individuals standing outside the Flash Museum. They blow up the door and charge inside... their destination, a statue of the Flash. We see the curator, Captain Kangaroo on the phone with the police, as the explosion got his attention. It's funny, the vandals cut the alarms, but still used loud heavy explosives to break through what appears to be a glass door. Once at the Flash statue, the trio starts gleefully smacking it with their blunt instruments. Captain Kangaroo Dexter Myles makes an appearance wielding a firearm, but gets pelted in the noggin by a piece of the Flash statue before he can do anything useful. The vandals, which includes an old man... who mocks the curator for being... an old man, decide to leave... but not before tossing a firebomb into the Flash Photo Gallery with hopes that the entire building will go down in flames. Luckily the Police show up and drag Myles out. We shift scenes to attorney Cecile Horton and her client the Flash as they lounge in Horton's family mountain hideaway. They discuss a recent event in which Flash's first attorney Peter Farley was the victim of the ol' exploding office gag. Somebody out there does not want the Flash to have decent representation. Barry grabs Cecile and runs her to Farley's side... and this may be the only scene where we see Ms. Horton crack a smile... either that or the art is just wonky. At the hospital, Farley is recovering. Horton goes cold-fish again and pretty much tells Barry to beat it. She tells him she'll be in front of City Hall later that evening, and he is welcome to meet her there. A doctor enters the scene to inform the Flash about the going's on at the Museum... this is news to our scarlet speedster, so he jams out with the quickness. Once there, the Flash checks in with Myles before running inside to try to minimize the amount of smoke damage to the exhibits. He does so by creating a whirlwind. Once the smoke is expelled he returns inside to survey the damage... luckily just in time to catch a poor firefighter who falls through the weakened roof. We shift scenes back to our three vandals. They are standing in an empty room aside from an empty table. They hear a voice over a loud-speaker that commands they remove their "micro-sonic devices" which look sorta like hearing aids, and leave them on the table. It then commands them to return to their normal, law-abiding lives and forget about everything they had done on this night. They all leave separately... and we see the legs of a pixie-booted individual... I'm guessing we're in for some Pied Piper shenanigans. We now join an in-progress police chase. A car speeds over a rickety wooden bridge, however, due to an errant oil slick, skids right into the drink. The car lands upside down in the muddy lake, and it looks as though those inside are doomed. Ah, but this is Central City... home to the Fastest Man Alive! The Flash arrives on the scene and saves the day. Afterwards, an officer thanks him and expresses surprise that the Flash is still "in action"... ya know, because he's a cold-blooded killer and all. The next day... well, I think it's the next day, the sky is... er, yellow... the scuzzy looking pair Mace and Spike roll up on the Woodside Psychiatric Clinic. Mace has brought Spike here for some head-shrinking due to violent outbursts against his mother... who has been dead for six years. Our poor young cretin thinks all women he sees are his mother, who by all accounts he has some unresolved anger toward. It just so happens that this clinic is where Barry Allen's one-time fiance, Fiona Webb is working through some issues... not the least of which, her would-be husband standing her up at the altar... and seemingly disappearing off the face of the Earth. Oh, yeah... and the Reverse-Flash tried to kill her during her wedding too... only being saved by the Flash breaking the yellow speedster's neck. She claims that she no longer feels anything for Barry Allen, and the Doc thinks she's making real progress... but sadly not with her lazy eye. Outside in the waiting room, Mace and Spike walk in and... oi, pull a gun on a nurse... demanding to be seen by "the nearest shrink in the joint"... I mean, I don't think you needed the gun here, ugly. I bet the nice therapist wouldn't have any problem talking to you. Anyhoo, they burst into the Doc's office. Spike hops onto the couch and begins telling his sob-story. The Doc, being held at gunpoint, carefully listens. The lad talks about his mother, and begins glaring at Fiona. He stands up, ready to attack. Luckily, the Flash is in the house. Dude's got some great timing, no? He makes Spike do the spins by pulling his belt off. He kicks the Kinison-looking Mace after catching a handful of bullets that had been squeezed off in his direction. After the bruhaha, the Flash takes a moment to chat with Fiona. She doesn't know that he and Barry are one and the same, so she holds no ill-will toward the costumed crusader. She considers him her savior, having killed the Reverse-Flash to save her. She says she'd be happy to testify on his behalf should his case go to trial. I'm really torn in how I feel about most things Flash-related from this era. This issue comes... nine issues after the apparent murder of Reverse-Flash... and seven issues before the trial begins... and the gavel only hits on the final page of that issue! I still can't help but have a soft-spot for this, even if it just drags on so relentlessly. On one hand, the story isn't bad... but there is almost a tangible dragging-on involved. Not going to blame any of that on Bates, as I'm guessing this was all editorially laid out to ensure the story roll on and Barry does what he does come Crisis on Infinite Earths... but still, it feels as though the story is on a leash, and just isn't being allowed to proceed. On the other hand... if I waited an entire month back in 1984 to read this, I'd have to figure I'd be disappointed month after month with nothing much actually happening. Reading this story in one fell gulp is one thing, but at twenty-odd pages every four-weeks? No thanks. Looking at the cover, it appears as though the "grateful" people of Central City have had a change in heart in regards to the Flash... likely due to the manslaughter charge hanging over his head. Inside, however, we learn that's not the case at all. Instead it's three mind-controlled people who trash the Flash Museum. There isn't any animosity involved at all... excepting our green pixie-booted friend who's giving the orders. I did dig that we got to check in on the poor jilted Ms. Webb while she convalesces at the clinic. I know throughout the trial she kinda wavers insofar as her sanity is concerned, but I really like that we get a glimpse as to the psychoanalysis she's been receiving here. Can't speak for the quality of it... but, I'm sure it's great comic book head-shrinkery. We learn that Cecile Horton hates the Flash. It's been awhile since I read this arc in toto, so I can't off the top of my head remember what her beef is... however, I'm guessing it's predicated in a silly misunderstanding. Now, saving the hardest thing to talk about for last... the art. Man, Carmine Infantino did some great stuff... however... unfortunately, this issue is pretty uneven... we go from a really nice looking page to... Oy, those are some ugly faces, several times here. I always hate bagging on art, but I gotta say there were some rather unpleasant pages and people in this book. Overall, I dunno. Really can't suggest anybody go out of their way to check this one out... though by the same token, can't suggest anyone actively avoid it either. The story is stretched, the art is uneven... but it's still the Flash, and I still consider it somewhat important. I know I'm riding the fence and talking out of both sides of my face pretty hard here... but I think that's where I'm gonna have to leave this one.